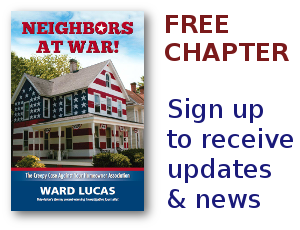 Ward Lucas Archives - Neighbors at War! I Feel Like A Little Kid! No Comments on I Feel Like A Little Kid! Retirement can be boring. That’s why I spend so much time on YouTube and other sites. Over a week ago I was researching HOA rules against any and all use of solar energy and came across an amazing device, so amazing I immediately bought one. It’s a solar oven that operates on a vacuum tube principle that concentrates the sun’s rays into a cooking tray. No Comments on Tuberculosis Sniffing Rats! I subscribe to all the science magazines, and I love this story! For many years I’ve read and reported on cancer-sniffing dogs, and African Giant Pouched Rats that can be trained to sniff out just about every kind of disease. In East Africa they’re now using the trained rats in prisons to sniff out tuberculosis. Their accuracy rate is almost 100%. LOL! If these rats are so good why can’t we train them to sniff out HOA scumbags?! ?